New results by a group of European and American scientists make it clear that the NASA/ESA Hubble Space Telescope is nothing less than a true black hole finder. An international group of scientists led by German Hans-Walter Rix from the Max-Planck-Institut fur Astronomie in Heidelberg is studying 24 nearby disk galaxies, similar to our own Milky Way, using the NASA/ESA Hubble Space Telescope. 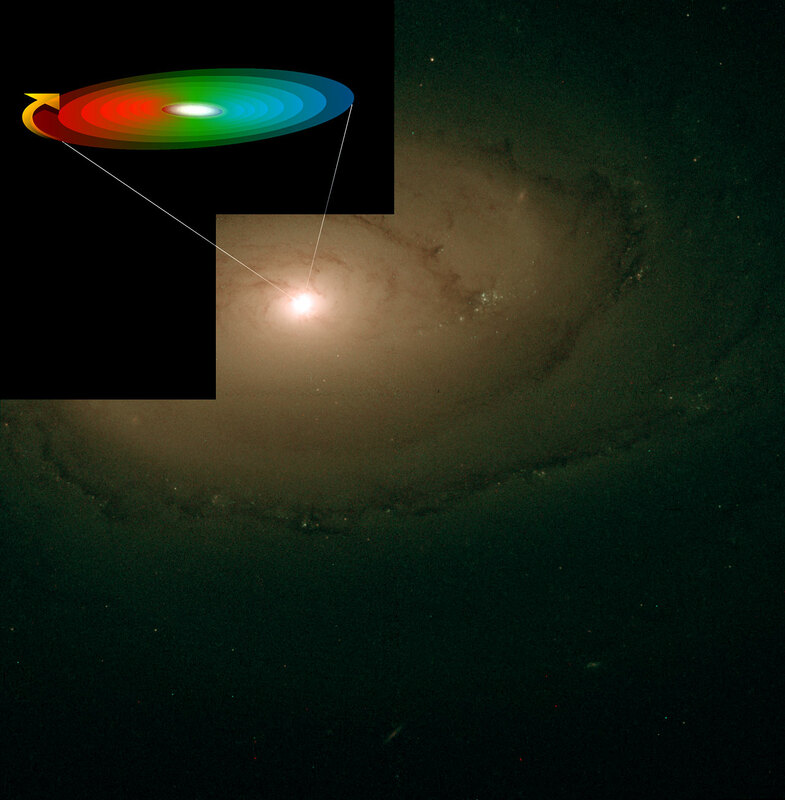 The group has measured the velocity of fast moving gas clouds at the centres of these galaxies and in many cases has found evidence for the existence of gigantic black holes there. In at least two of the objects, they discovered gas at the centre moving with a velocity of 10 million km/hour - 30 times faster than it moves anywhere else in the galaxy. Overall, the study confirms that supermassive black holes must exist in the majority of ordinary galaxies. +It is quite clear that the nearby Universe is full of black holes in galaxies. Using Hubble we now routinely find black holes in perfectly typical, normal, boring galaxy centres. Indeed it seems likely, that Nature can't make a big galaxy without a black hole the centre. ; says Hans-Walter Rix. The group has also found gas clouds very close to the central black holes, something that is usually expected to trigger the emission of a lot of light. The group's findings, however, show that not all galaxy with gas around their centres are emitting large amounts of light. Hans-Walter Rix says +It is very probable that some of the black holes at the galaxy centres are 'eating in the dark' without much emission of light. ; The new results support recent speculations that the material may fall into the black holes before it has time to radiate its energy as light. This week the group is presenting the first results of their galaxy survey, named 'The Survey of Nearby Nuclei with STIS (SUNNS),' at the summer meeting of the American Astronomical Society in Rochester, USA. Here a large number of black hole astronomers are gathering to discuss their findings with Hubble. One of the sessions will concentrate on results from one of Hubble's instruments, the Space Telescope Imaging Spectrograph (STIS). STIS combines a camera with a spectrograph and covers a wide range of wavelengths from the near-infrared region to the ultraviolet. A spectrograph spreads out the light gathered by a telescope so that it can be analysed to determine properties of celestial objects such as chemical composition or their radial velocity through the Doppler effect 'In fact, only STIS could detect the very fast motion of the gas at the centres of these galaxies. We need the high resolution of Hubble above the atmosphere to isolate the motions near the black hole. 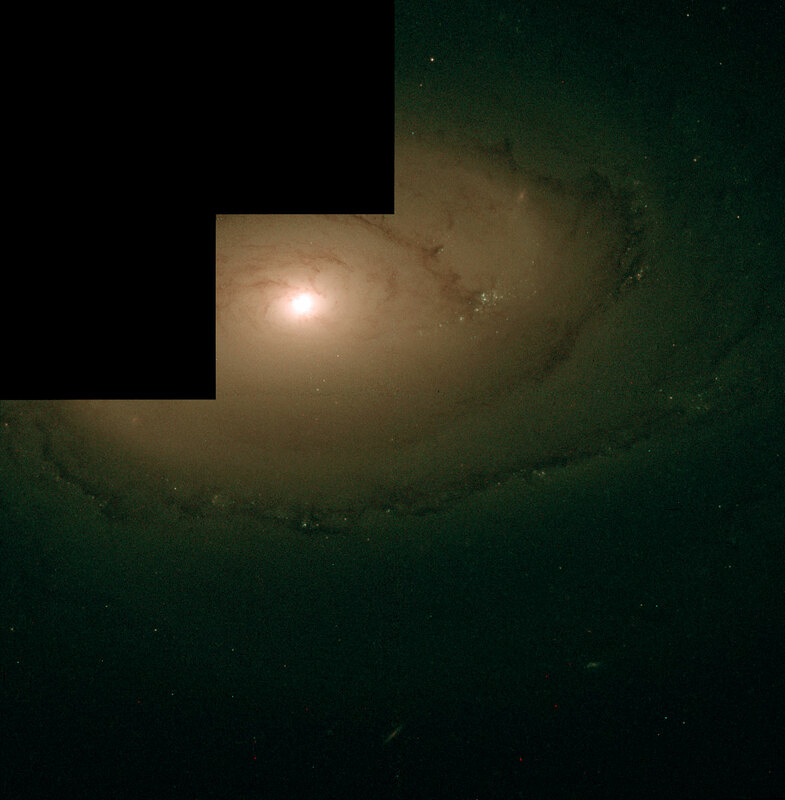 Hubble is a true black hole finder', says Rix. The results of the SUNNS project are being published in a series of papers, led by Luis Ho (Carnegie Institution), Joe Shields (Ohio University) and Marc Sarzi (MPIA, Heidelberg and University of Padova, Italy). Hans-Walter Rix's other collaborators are Daniel H. McIntosh (Steward Observatory), Alexei V. Filippenko (University of California), Wallace L. W. Sargent (Palomar Observatory), and Michael Eracleous (Penn State University). Roeland van der Marel's collaborators are: Gijs A. Verdoes Kleijn, Tim de Zeeuw (both from Sterrewacht Leiden), and C. Marcella Carollo (Columbia University). These results will be published at oral presentations at the summer meeting of the American Astronomical Society and in a steady flow of upcoming scientific papers (see e.g.